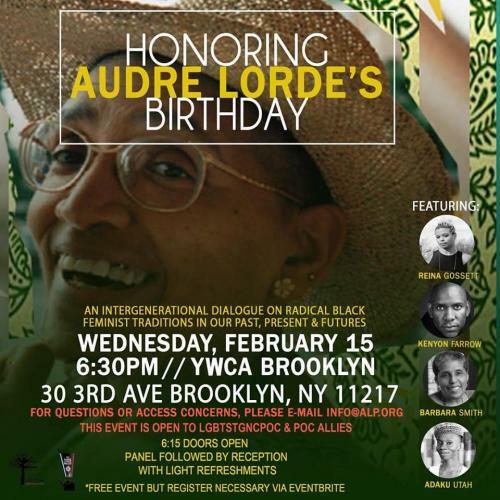 In lieu of a changing political tide, this year for our annual celebration of Audre Lorde’s Birthday, we will uplift the role, historical legacy and future of Black Feminism, by highlighting how it has been foundational to our LGBTSTGNC POC resistance and resilience. We will be holding an Intergenerational Dialogue on Radical Black Feminist Traditions in our past, present & futures. Come with your curiosity, desire, and hunger for our collective analysis and knowledge! We will be co-hosting this event with GRIOT Circle, an organization exclusively dedicated to serving the needs of elder LGBTQ people of color in New York City, and know this will be a special night. We hope to open the dialogue on this political moment and root the role Black Feminism has and will play for our Black/Brown LGBTQ political futures. THIS IS A FREE EVENT! Please register via the Eventbrite link! The panel will be followed by a reception with light refreshments. The Audre Lorde Project is a Lesbian, Gay, Bisexual, Two Spirit, Trans and Gender Non Conforming People of Color center for community organizing, focusing on the New York City area. Through mobilization, education and capacity-building, we work for community wellness and progressive social and economic justice. Committed to struggling across differences, we seek to responsibly reflect, represent and serve our various communities. GRIOT Circle (Gay Reunion In Our Time) is a community based organization which addresses the needs of older lesbian, gay, bisexual, transgender and queer (LGBTQ) people of color.